The Dream platform specializes in providing critical penny stock news reporting on companies that are publicly trading within the OTC Stock Market. 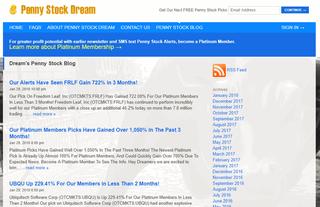 While the news reporting from their penny stock blog platform is expansive, dealing in everything from Pink Sheets stocks to the NASDAQ and the wide range of everything in between, they are most notably recognized for the in-depth news coverage that they provide on underrepresented penny stocks. This platform provides investment newsletter coverage on high interest stocks that they believe hold solid potential for traders with frequent updates on small-cap and micro-cap stocks being posted directly to their investment blog page. The blog is frequently updated with the most relevant and up to date Penny Stock Exchange and OTC Market News available and has helped traders throughout the world come across little known micro-cap stocks that may otherwise fly under the radar.